The details on child car seat laws, types of seats and proper installation. Like most other animals in the kingdom, humans have an instinctive desire to protect their offspring from harm, so using child safety seats seems like a matter of common sense. But as many parents have discovered over the years, these seats are actually rather complicated. For one thing, there are a few different kinds of seats. For another, there are laws governing parents’ usage of child safety seats while driving, and these laws vary by state. And then there’s the fact that installing the confounded things can be a pain in the parental tuchus. You have better things to do than sort through the details, so we’ve broken down the various laws, seats and systems for you. The infant seat can only be installed in the rear-facing position, which ensures maximal whiplash protection for a young child. Children under the age of one should always ride in the rear-facing position. 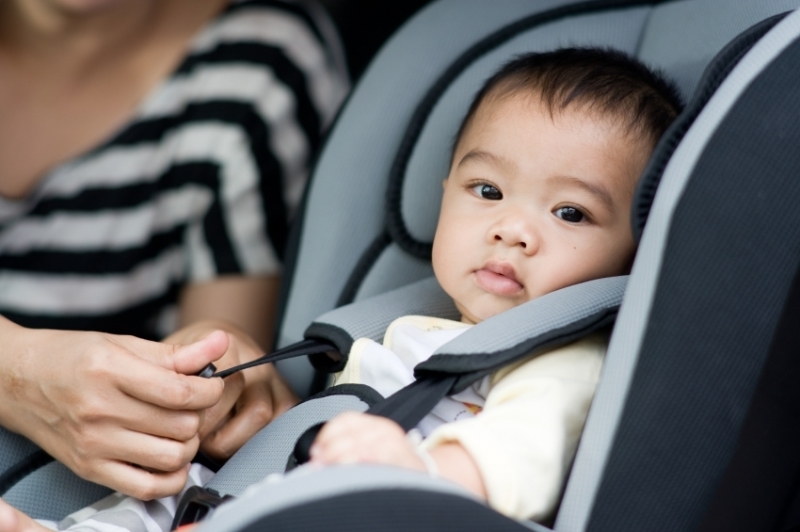 The National Highway Traffic Safety Administration (NHTSA) recommends keeping your child facing rearward until the seat manufacturer’s weight limit—generally between 20 and 30 pounds for an infant seat—has been exceeded. The convertible seat is a hybrid product that permits both rear-facing and front-facing installations. It’s typically bulkier than an infant seat, but its weight limit can stretch to about 50 pounds. This allows your child to face rearward for longer, and when that’s no longer feasible because of legroom issues, you can turn the seat around and use it as a front-facing seat as long as the weight limit hasn’t been reached. …but if not, you’ll need to invest in yet another seat, a dedicated booster seat, which has the highest weight limit of all—up to 100 pounds, or sometimes even more. Because safety-seat regulations are created by state legislatures, the legal details vary widely depending on where you live. We can, however, make a few general observations. If your child is three years old or under, a safety or booster seat is mandatory. If you live anywhere except Florida, it’s four or under, and most states put the minimum age for “adultâ€ seatbelt use between five and seven years. Beyond that, it’s kind of a mess: some states allow law officers to pull you over solely for a child-restraint violation, other states require an unrelated additional violation, and the penalties range from a $10 fine to a $500 fine and points on your license. The Insurance Institute for Highway Safety has a couple of helpful web pages— see a list and a map of child restraint laws—if you want to see what the deal is in your state of residence. So you’ve bought a seat and read up on the laws; now it’s time to put the seat in your car. Easier said than done. We’ve all seen parents engaged in comical backseat wrestling matches with safety seats. To avoid joining their ranks, here are a couple tips. 1. 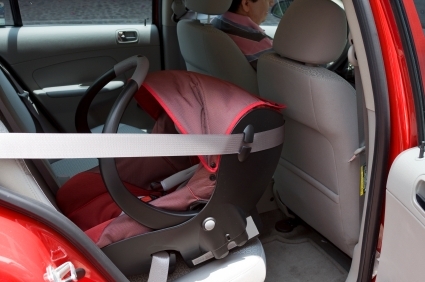 Make sure both your car and car seat have LATCH. LATCH stands for Lower Anchors and Tethers for CHildren, which translates as “a much easier way to install a car seat.â€ On the vehicle side, it appeared in some models as early as 2001 and has been required by the government since 2003; on the safety-seat side, virtually every modern seat is LATCH-compatible. In any case, this is how it works. For a rear-facing seat, LATCH-equipped vehicles provide anchor points—typically little metal loops marked with icons—at the base of the rear seat cushion. LATCH-compatible safety seats have two outer straps with hook-like attachments that fasten to these anchor points, while a central strap under the front of the safety seat pulls the outer straps tight once they’re anchored. For a front-facing seat, the lower straps work the same way, but there’s also a tether at the top of the seat that attaches to an anchor point either on the vehicle’s rear shelf or at the top of its rear seatback. Don’t take our word for it, though—please consult the owner’s manuals for both your safety seat and your vehicle and follow the instructions provided. If either your car or your safety seat lacks LATCH, don’t fret. Provided that you follow the seatbelt installation instructions, your child should be equally safe. Just know that you’re more likely to have those wrestling matches this way. If you’re still stumped, consult a National CPS (Child Passenger Safety) Technician. That’s right: there are trained professionals near you who have completed the requisite four-day “boot campâ€ and received their two-year certification as CPS specialists. Don’t doubt their credentials—trainees must pass three hands-on skill assessments and score 83 percent or higher on a written test in order to become certified. We’ve heard of free workshops, but chances are there’ll be fees involved. You can learn more on their website. We know you’ve got that instinctive desire to protect your kids on the road, and now you hopefully have the necessary information as well. Be safe! Your kids will thank you someday.